David Spigel, MD of the Sarah Cannon, Nashville, TN, presents the final update of the Phase I study of rovalpituzumab tesirine as a single agent in patients with relapsed small cell lung cancer (SCLC) (NCT02819999). Rovalpituzumab is a first-in-class, first-in-human antibody drug conjugate. The trial found a recommended intravenous (IV) dosage schedule for the drug of once every six weeks, two times. Patients with both sensitive and primary resistant refractory relapsed disease showed high response rates compared with historical controls. The overall group showed response rates of just under 20%. Dr Spigel thinks the most exciting prospect is that with the target of this antibody, Delta-like protein 3 (DLL-3), higher response rates are seen at higher expression levels. 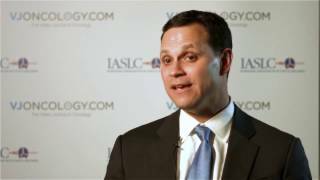 DLL-3 is seen in about 90% of small cell lung cancers. Phase II and Phase III development will follow from here. Recorded at the 2016 World Conference of Lung Cancer (WCLC) of the International Association for the Study of Lung Cancer (IASLC) in Vienna, Austria.